Politics in any form is hard for me. I avoid confrontation and disagreement like the plague, so almost everything to do with politics makes me go running for the nearest blanket to hide under. But one of my Political Science students brought me a book catalog from a trip she went on, and The President’s Kitchen Cabinet was in it. I love food and anything to do with it, and looking at the history of politics through the lens of a thing I enjoy made this book an incredible read. Miller’s extensive research into the untold, and often undocumented stories of the African American cooks and staff who have taken care of our presidents since the inception of the U.S. was fascinating. From George Washington’s slave, Hercules, to the winning child of First Lady Michelle Obama’s Let’sMove! cooking contest, this book is full of names and legacies you’ve never heard of but absolutely should have. Instead of a linear time-line, Miller’s book is broken up into themes in order to lay out the many different facets of the presidential food diamond. He starts by explaining the evolution and history of how we ended up with the position of Executive Chef in the White House, and the many different jobs and employees it takes to feed a president, their family, and their staff. He talks about the importance of African American cooks and their contributions to these many jobs, and quite frankly the lengths of research and work this man did to bring these stories to life is nothing short of amazing. From quickly jotted grocery lists to extensive archive combing, to tracking down and interviewing as many people as possible, Miller goes above and beyond to bring the most accurate and well rounded picture. My personal favorite stories were the chapters on feeding presidents on the move. I don’t often think of the president as constantly going on diplomatic trips, or touring the country to meet their constituents, but apparently (obviously), they’re on the move more than not, and that makes feeding them and their party all the more difficult. The amazing cooks who fed presidents in the newly minted train cars, and those who’ve had to prepare three course dinners in tiny airplane kitchens managed amazing culinary feats. The ways in which these African American cooks and stewards got to their positions was also fascinating. 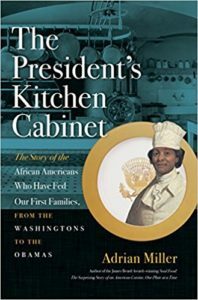 In many cases, particularly pre-1900, presidential cooks and servants were often forced to work in these executive positions since they were slaves or servants who were torn away from their families to cook in the president’s new house. It was fascinating and frustrating to learn of Washington’s underhanded move of rotating his cooks and house slaves out of the executive mansion every 6 months and sending them back to Mt. Vernon so they wouldn’t be able to gain their freedom from Philadelphia slave laws. Or of Jefferson taking his cook to France to be trained by a French chef, only to leave the man in slavery upon his return to the U.S. But on a positive end, it was uplifting to learn how many presidents often went to their African American cooks for advice on Civil Rights, and in turn, their cooks were able to bring many racial issues to the president’s attention through their relationship with him. Each chapter finishes with several recipes belonging to the cooks spoken about in the chapter, and each recipe has an excerpt about the recipe’s history and it’s inception. I can’t tell you how many snacks I had to go get while reading this book because so many of the recipes sound so good. In all, this book has been excellently researched and opens up a whole untold area of history that is not only important for the time we live in, but essential to telling the whole story of the U.S. presidency. You should read The Residence. It’s a behind the scenes look at everything that goes into running the White House. I think I’ll be checking this one out though.